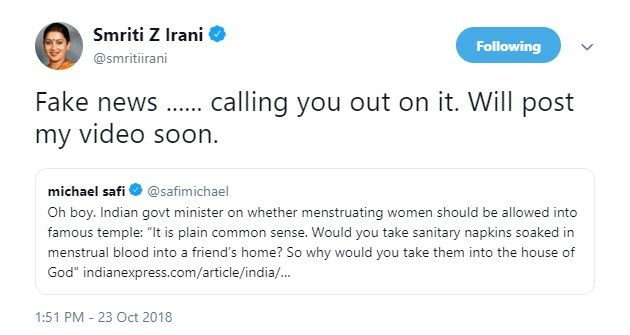 A recent video of cabinet minister Smriti Irani has gone viral on social media platform Twitter where she is asking the audience, "Would you take sanitary napkins seeped in menstrual blood into a friend's home?" ANI shared a video where a 1 member from the audience tried to asks Irani about the Sabarimala protests vow, which is going on nowadays. Minister Irani, adding that she will not comment on the HIGHEST Court verdict because the minister is an active member of the Union Cabinet, she said, " I have the right to pray, but no right to desecrate. I am nobody to speak on supreme court verdict as I'm a serving union minister in the central government. Would you take sanitary napkins seeped in menstrual blood into a friend's home? No.Why take them into the house of God?" However, She, in a tweet from her personal handle, called the video "fake news" and said that she will post the real video soon. Smriti Irani has called the report carrying her remark as "fake news". According to various media reports, Simiriti Irani made the remarks on Tuesday at an event in Maharastra, Mumbai where while talking on the Sabarimala issue she had said that "the right to pray did not mean the right to desecrate." "I am nobody to speak against the Highest Court verdict as I am a serving cabinet minister. But just plain common sense is that would you carry a napkin seeped with menstrual blood and walk into a friend's house. You would not. And would you think it is respectful to do the same when you walk into the house of God? That is the difference. I have the right to pray, but no right to desecrate. That is the difference that we need to recognise and respect," Irani said. The Union textile minister was speaking at the "Young Thinkers" conference organised by the British High Commission and the Observer Research Foundation in Mumbai. "I am a practising Hindu married to a Zoroastrian. I have ensured that both my kids are practising Zoroastrians, who can go to the fire temple and pray," she said. Irani recalled that when her children were inside the fire temple, she had to stand outside on the road or sit in the car. "When I took my newborn son (to the fire temple), I would give him at the (temple) entrance to my husband and wait outside, because I was shooed away and told not to stand there," she further said.